Here is another matchbox I made for a Swap-Bot swap. This one required you to use your partner’s favourite colour(s)! Fortunately, I got a colour I like! One of my other choices was orange, no offence to orange lovers but to me it is usually yuck! This purple, SU! elegant eggplant, is one of my favourite purples of all time, especially when used with the muted plums. I can’t believe they got rid of pale plum. Fortunately, I still have lots! I tried colouring the twine with a SU! perfect plum marker but it just doesn’t soak in like my Copics do, maybe they are a bit dry, so I switched. That’s why the colour on the one end is a bit different. 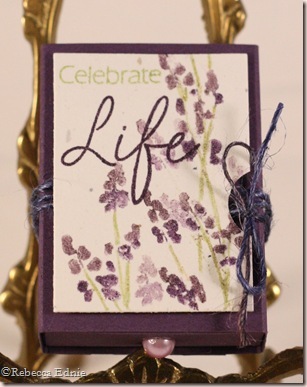 I just love the watercolour look I get from using this stamp with markers. SU! markers this time,I just can’t get the hang of using Copics on stamps. I didn’t even have to spritz the stamp to get this effect. For the generation stamping, I just huffed on the stamp to get the second impression. This has to be one of my most used stamp sets even though it is relatively new to my collection. Any time I need a pretty and pretty easy card, I go for this set. I can make a card using it in about 5 minutes and even with a bit of jazzing, I can do it in 10! It is appropriate for almost any occasion, for a woman at least! You can’t see it but I coloured over all the purple stamped areas with a light purple Spica pen and since I don’t have a green Spica (what’s with that? ), I used yellow. Gives it a subtle but pretty sparkle. Guess what? I found out the new version of Windows Live Writer (free to download if you use any Windows operating system) supports emoticons! So get ready to see more of them! In case you’ve never heard about Live Writer, it is a relatively simple word processing program that uploads your files directly to your blog. As you type, you can see how it will look on your blog complete with font, type size and colour, bulleting, background colour etc. It also includes some simple photo editing, watermarking etc. as well as the ability to schedule posts and I’ve never had one not show up. (I’ve screwed it up…) It is SOOO much better than typing right into Blogger. Download it today! What a beautiful project! I love your watercolored look!Thanks for visiting my blog the other day. You asked a question about the flowers on my card. They come as ribbon on a spool, and I'm pretty sure they were by Maya Road, called Large Organza Roses Ribbon-cream. Hope that helps!